When University of Wyoming student Chelsea Carter of Laramie visited her personal nurse practitioner as a teenager, she appreciated her kindness and thoroughness. “She was my role model,” Carter recalls. That experience inspired Carter to enroll in UW’s Doctor of Nursing Practice (DNP) program, which offers a unique set of skills to profoundly change health care delivery in Wyoming. “I'm a Wyoming native and have a lot of pride in my state. When I found out the University of Wyoming would be offering a DNP degree, there was no question about it -- I was going to work my hardest as an undergraduate student, in hopes of being admitted into the DNP program,” Carter says. UW’s trustees in 2010 approved the new DNP program as part of a national shift to offer extended training for nurse practitioners and in response to Wyoming’s health care needs, says Mary Burman, dean of the Fay W. Whitney School of Nursing. UW’s DNP program offers two options: 1) family nurse practitioner (FNP), which prepares nurse practitioners (NPs) to practice as primary care providers and 2) family psychiatric mental health nurse practitioner (FPMHNP), which prepares NPs to practice as mental health providers. Both FNPs and FPMHNPs are prepared to diagnose and manage illness, including medication prescribing. 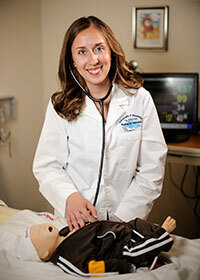 The first DNP students enrolled in the fall semester of 2012, so Carter will enter the workforce in 2015. Wyoming’s health care community recognized the need to bolster both primary care and psychiatric care in Wyoming, and fully supported the move to the new DNP program, says Associate Professor Ann Marie Hart, the DNP program director. She says the program offers training in the basic skills required to practice nursing, as UW previously offered at the master’s degree level, but adds a lot more. Carter says the strong emphasis on patient behavior changes attracted her to the DNP program. She says health behavior change is significant, because people often behave in ways that are hazardous to their health. The DNP program attracts people who want to work in rural areas, Burman says. Hart adds that many nursing students do their required rotations in rural areas. “We find they want to stay and work in communities such as Saratoga, Guernsey, Lusk, Pinedale, the Wind River Reservation and other areas where they contribute to meeting community health care needs,” she says. Working in rural settings is challenging, but offers opportunities to be creative, Carter adds. Burman says a number of the new DNP program students are younger than practitioners who obtained degrees under the master’s degree programs. To provide students with the skills they need to instill behavioral training in DNP students, UW has added psychological training led by Assistant Professor Jenifer Thomas, who teaches courses on using health behavior changes to prevent or treat diseases. The DNP adds a critical component to the mix of Wyoming health care including primary care physicians, pediatricians, internal medicine doctors, OB/GYN specialists and others, Burman says. “Now, we are providing a new set of skills that emphasize behavior and lifestyle changes that add some really exciting things to expand primary care and mental health care in Wyoming,” she says. But the School of Nursing provides more than a set of technical skills, Carter says. The DNP is among other School of Nursing programs that play a role in meeting Wyoming’s health care needs. The school offers a program with the community colleges to teach the associate degree with a transition to the bachelor’s degree (RENEW); an accelerated BSN through the Outreach School (BRAND); and an option for RN/BSN completion online. Other College of Health Sciences units also provide significant value to the state through education and outreach, including the School of Pharmacy, and Divisions of Communication Disorders, Social Work, Kinesiology and Health, Wyoming Institute for Disabilities, and Medical Education and Public Health/Family Medicine Residency Programs.